Garden Pet Urns offers a unique and charming way to store pet ashes. The stepping stone urn turns your landscape garden into a very special and meaningful spot. 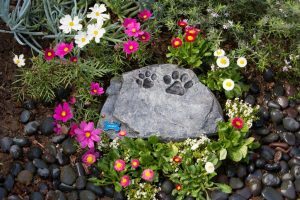 It creates a lovely way to pay tribute to your beloved pet in a peaceful, natural setting. Pet memorials reflect the deep feelings and emotions we have for our pets. Your pet was an important part of your family, one whose loyalty was limitless and love was unconditional. We know your love for your pet will last a lifetime, and we want to help you honor the memory of your beloved companion. The garden stepping stone Urn is completely waterproof and made of ultraviolet safe material. 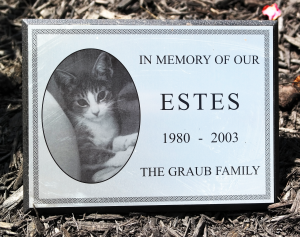 Our Pet “Remembrance Plaque” is a lovely way to commemorate your beloved pet. Also a nice way to dedicate a tree, shrub or garden. 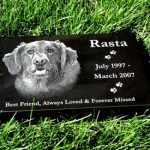 You can customize the metal photo plate with a picture of your beloved pet; or the plate can be engraved with a breed-specific image. Treasure your friend forever with a pet memorial. Exquisitely crafted of solid black laser etched granite, each stone comes with a nicely polished finish. All the memorials are 2″” thick.